Kosherfrugal.com - Frugal Living in Israel: Save BIG when you rent a car for Yom Ha'atzmaut! Need wheels this Yom Ha'atzmaut? It can be hard to get around with limited public transportation on Israel's Independence day, so if you have plans to get together with friends or family, or visit one of the 70+ museums that are open for FREE to the public on Yom Ha'atzmaut, you are probably considering renting a car. 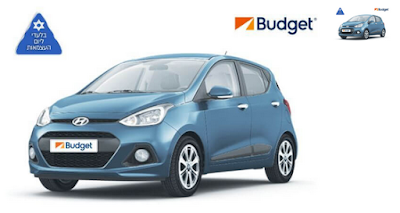 There's a Groupon deal for Budget Car Rentals, just for Yom Ha'atzmaut! The deal is 69nis per day (including VAT), for an X-class vehicle (Hyundai i10 or similar). Insurance is INCLUDED, and you'll have a maximum of 120 km travel per day. Maximum rental period is 7 days for this price, with no option of extending further. Available April 30 - May 5. Driver must be at least 23 year old and have had a license for at least 2 yrs. If you exceed 120 km, you'll be charged 1nis + VAT for every km over the limit. You'll need a valid credit card in the driver's name available. There are other conditions, please read the Groupon deal carefully, or call Budget at *2200 with questions!